While I'm waiting for my broken nail to grow out enough to finish swatching the spring/summer nail collections I was working on, I've been browsing through some old, un-posted swatches and these caught my eye. I almost forgot about these awesome polishes I found at DSW a couple years ago! The brand is Anise and I know nothing about them except that the company headquarters are in Florida and the polishes are (were?) sold at DSW. They have a website showing some of their recent collections, but you can't purchase from it, nor can you order them online through DSW. Anise Grape Is The Word. 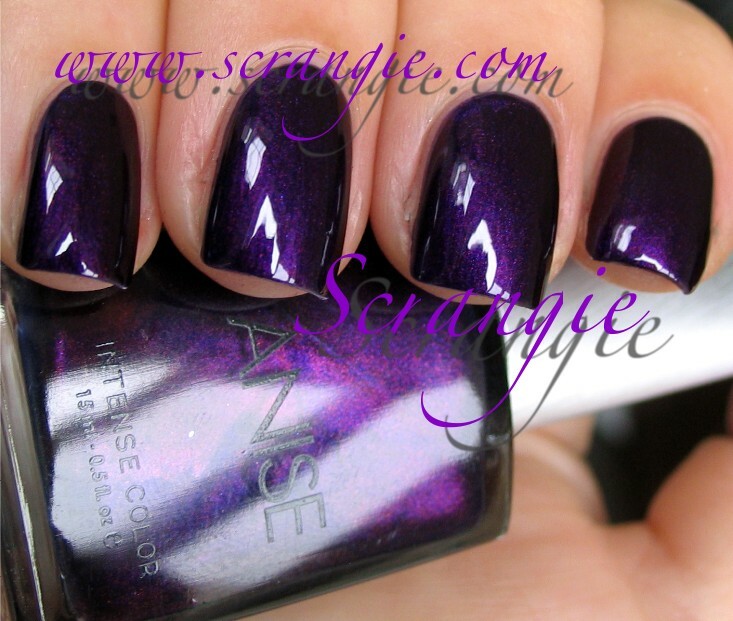 This is a super-rich dark purple shimmer. It's comparable to other bold, dark purple shimmers like NARS Purple Rain or Illamasqua Baptiste. It has visible red and blue particles and a velvety-glowy looking smooth shimmer finish. Anise Jewelry Optional. This color flashes between orangey-gold and golden olive with a slight amount of red-orange duochrome. Like Grape Is The Word, it's very rich looking. Lots of color, very luxurious and velvety looking finish. Reminds me of a green version of Sally Hansen Bronze Ablaze. It's been a long time since I've worn either of these, but I remember the formula being good. Not too thick, not too runny, very opaque. Now I'm kinda wishing that I had picked up more of these because I don't remember seeing them the last time I was in DSW. Or maybe the reason I bought just these two is because they were the only good ones? Hm. Anyone have any of these? Do they still sell them? Ooh, I really like Jewelry Optional! No surprise, since I snatched up Bronze Ablaze... I've seen these at DSW but never tried them, thanks for the swatches! They still do I just picked up a bunch at DSW about 2 weeks ago from their S/S 2012 and F/W 2012 collections....awesome colors! Grape is the Word makes me want another purple in my already full of purple nail polish stash. Have you seen this? I would love to see your review of it! Is caviar the new crackle? These are lovely colors! My DSW doesn't sell the polish :-( Boo! Least you have a DSW...I don't even think there is one for 500 miles around me! I love that Grape is the Word! Very dark and purply, well, that's what I call it, lol. Thanks for the photos. Grape is the Word is so gorgeous! Wow, these are amazing and so rich! Totally adding both to my wishlist! DSW definitely still sells them I just picked up two last week!! Really pretty bright spring/summer colors too! They definitely still sell them I just picked up two last week! And they have some really bright pretty spring/summer colors too! wow these are gorgeous shades. I still see DSW sell these polishes but I don't know about these colors though. I have a couple of Anise polishes and the formula is pretty good IMO. I love Anise polishes too! I have a bunch of them. In my experience, only select DSW stores carry them (maybe 30-40% of the stores), but I just saw them in one as recently as a few weeks ago, so I believe they do still sell them!